The Original Pet-Mat is a heating pad designed to keep your canine companions warm this winter. Pet-Mats are designed in Australia and are the latest in heating pads for pets, utilising carbon fibre technology. This results in a more economical heating device for keeping your pet warm. This is particularly beneficial if your animal is sick or suffers from arthritis. HOW DOES THE PET-MAT WORK? This compact, flexible, durable heating pad operates on a low voltage (12 volt) system which is entirely safe as it is designed to attain a maximum of 40°C (104°F) whether it is covered or not. The manufacturer recommends that a cover (provided) is used to ensure maximum comfort. Pet-Mats™ have been designed to meet the stringent electrical standards (AS/NZ 335.2.81) written for human contact heating mats. 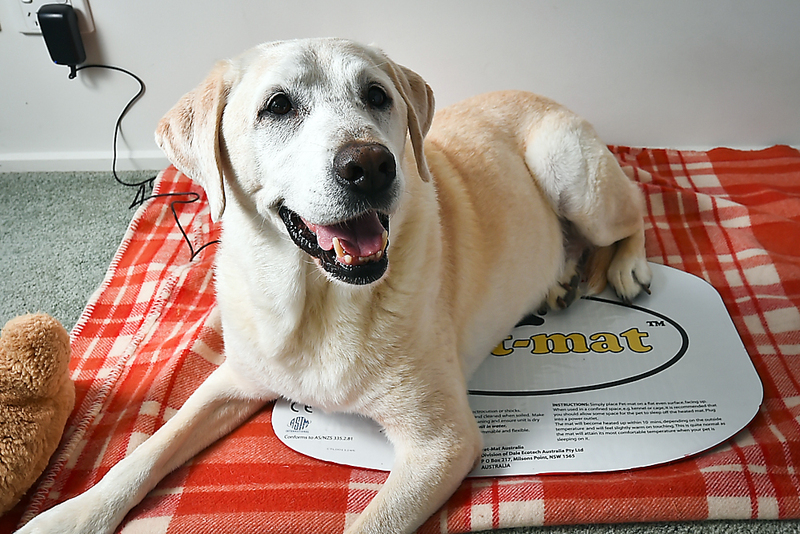 The Pet-Mat heating mat is waterproof, you only need to keep the transformer and cords away from water or wee, but it won’t catch on fire or even give an electric shock if it comes in contact as it is based on DC. We found that Pet-Mat™ pet heating pads maintain a temperature only slightly warm-to-the-touch, until body contact was made by our dogs. At first, we thought that it was not working properly but after seeing our dogs taking turns on cold winter mornings, we realised that the area covered only starts warming up after our dog lay on his heating pad. One of our Malinois usually lies on our feet whilst we work but he decided this new option was more appealing on chilly winter mornings! This latest model includes a thermal cut-off so you can simply switch on your Pet-Mat™, and leave it on. If it gets too hot it will cut off, and turn itself back on when it has cooled appropriately. There is added insulation at the bottom of the pad so the heat is not drawn out from the floor or surface, ensuring more economical heating. Instructions state the Pet-Mat should be placed on “an even surface” but it is flexible so it just needs to be supported. The manufacturer's advice is to place it on firm surfaces such as trampoline beds or firm couch cushions. However we used ours on top of the cushion at the bottom of a dog bed which was not particularly even and it worked just fine. Cleaning your mat is easy: you can wash it under running water (avoiding the electrical connection) or wipe it off with a damp cloth. 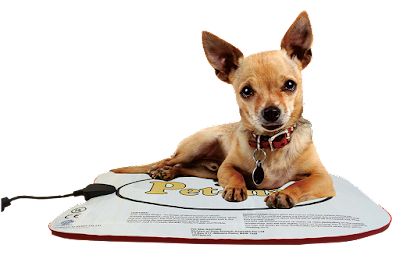 The Pet-Mat™ pet heating pads are available in 3 sizes. All Pet-Mats come with a 12 month manufacturer warranty. Each Pet-Mat comes with a standard yellow cover which tends to slip off the pad's edges pretty easily when our (large) dog readjusts himself on his bed. It is also quite thin so I am unsure what the wear and tear will be like with our large dogs using throughout the winter months. On a positive note, you can purchase additional covers separately from many retailers. Trade enquiries also welcome via the Pet-Mat website. Disclaimer: Product gifted by Pet-Mat for editorial consideration.